Getting a remortgage is a big decision. Most people do not tend to remortgage as there is a lot of hassle involved. It is important you remortgage as therefore you can have the best rate in todays mortgage market if you remortgage. For example, a person with a mortgage may have been on a fixed term of 5% for 2 years when he/she first took a mortgage out. After that time has expired, the mortgage lender will charge the higher rate. It is quite essential if you want to save money to remortgage at this point. Remortgaging your property will save you a vast amount of money. In recent years remortgaging has become a much simpler and more common process. More and more lenders are offering specialist remortgaging services - often with free legal and arrangement fees. As well as reducing your monthly payments, you can also use remortgaging to release the equity that's built-up in your property over time. If you have owned your property for several years, it could be worth more than your outstanding debt therefore taking out a larger mortgage could release some extra cash. This could be spent on home improvements, a new car or a luxury holiday if you like. Mortgages, remortgages, loans, self employed or are you in debt? 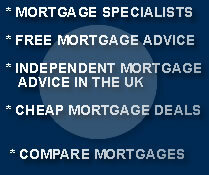 Mortgage Help Centre, free mortgage advice all over the UK.